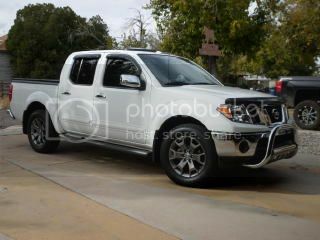 For more information on the 2019 Frontier and the complete Nissan vehicle lineup, please visit NissanNews.com. Current: 2016 Nissan Murano SL, Pacific Sunset, Cashmere Leather interior. 2010 LE CC 4x4 Avalanche White, Steel Leather interior, stock. 2007 LE CC 4x4 Black, Steel interior, stock. With Ford demanding high prices for the all-new Ranger - and no bargains to be had from Chevy on the Colorado - I expect even more sticker-shocked buyers to be looking at at the Frontier. It will remain the only mid-sized truck on the market that isn't selling for insane prices. I have owned 3 Frontiers; two 2nd-Gen's and my current 1st-Gen. The only thing that could pry me away from my beloved 2002 Desert Runner would be a new one in this configuration: Desert Runner, black - I cannot stand that steel gray - interior, King Cab. Will they make that for me? while i agree its cheap and outdated and will interest a lot of buyers. Rangers will have a pretty large market, the amount of tech and luxury in them is decent and many who think the new full size trucks are too large and expensive. the most optioned ranger is 10k more, but i dont see that a problem for all they offer now days. I think it's great though, it shows that the 2nd gens can stand the test of time imo. A new 3rd version would be nice, but its like Ive told others, I bought the Fronty b/c I wanted a truck, not a truck that acts like a car with so many bells and whistles that I forget that it's a truck. It would be cool if that 7" display had andriod auto/apple carplay. That would be asking too much, my 2018 Rogue has car play but my 2018 Titan which cost $18,000 more than it does doesn’t have it so go figure.